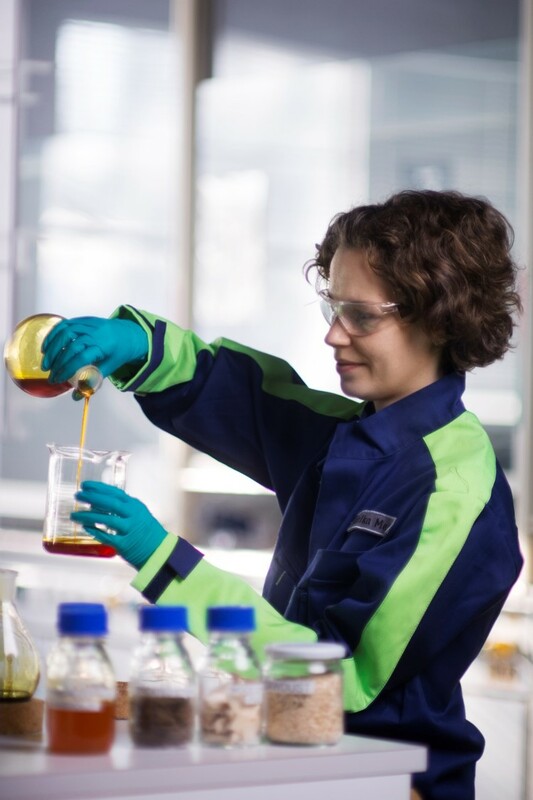 Neste is the world's leading producer of renewable fuels from waste and residues. This accomplishment required a decade of R&D. In 2006, Markku Patajoki, development manager at Neste, joined a project that focused on researching raw materials and also using a wider range of raw materials in the production of renewable fuels. The raw material preprocessing technology developed by Neste has been an important step in the use of new kinds of raw material sources. The catalysis in the high pressure and temperature of renewable fuel refining requires a raw material source that is as pure as possible. In 2015, waste and residues already accounted for almost 70% of the raw materials in renewable diesel produced by Neste. In the future, one of Neste R&D's key goals is to find ways of utilising fat-containing waste of an increasingly poor quality. In 2015, the waste and residues used by Neste in the manufacture of renewable fuels amounted to almost 2 million tons. They were used in the creation of almost 2 billion litres of renewable diesel, which is the approximate total consumption of 2.1 million cars over one year. Compared to fossil-based diesel, renewable diesel refined from waste and residues can reduce greenhouse gas emissions by up to 90%, depending on the quality and type of the biomass. According to Patajoki, waste and residues currently used in Neste’s manufacturing of renewable products include animal waste fat, cooking oil residue, waste oil from vegetable oil production plants and inedible, technical corn oil created as a by-product of ethanol production. Currently, the total number of raw materials being researched is 30. “Algae oil is an interesting raw material; but introducing it to commercial fuel refining still requires more R&D. We already study the use of logging residue and our goal is to find a cost-effective, profitable way of manufacturing fuel out of it,” says Patajoki. “As animal waste fat may originate from a number of sources, the suitability of each source must be studied separately. We must also ensure whether the raw material continues to be of the same type, or whether the quality varies by season, for example. In practice, we gather waste and residues from many small flows, so it has been essential to resolve logistical issues right from the start. As dictated by the applicable laws, some raw materials are taken to collection locations where we can recover them, whereas we need to have direct contact with waste and residue producing companies to reach many other kinds of sources,” continues Patajoki. Of Neste’s approximate 5,000 employees, as many as 1,300 work with R&D and engineering. Neste also engages globally in waste and residue utilisation cooperation with several research institutes and universities. “For us to retain our position as the leading manufacturer of renewable fuels, our R&D must be innovative, and we must continually understand where the world is going. We must do such R&D that the results also precisely match our customer’s needs,” says Patajoki. He finds that there is considerable future potential for bio-based products.